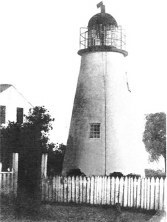 The first Structure at the current City Hall Site was the Lighthouse built in 1831. The Second structure built -- was the three story school building. four-story School Building which stood their. The first City Hall at that location was a monument to the victims of Hurricane Camille --- The new Municipal Complex is a monument to the victims of Hurricane Katrina. Following Hurricane Camille, former Mayor J.J. Whitmann addressed the Board of Alderman in January 1970 with a proposal for a new City Hall. He stated that $69,000.00 of the cost would be derived from the U.S. Office of Emergency Planning and $30,000.00 was to be from insurance payment from the old City Hall which had been built in 1920 and demolished by Camille. Preliminary designs were made by the U.S. Corps of Engineers. Alderman Jim Cerra's comments were that it looked like a first class Chicken Coop. Local Architect John Mykolyk made revisions which were later accepted by the Board. 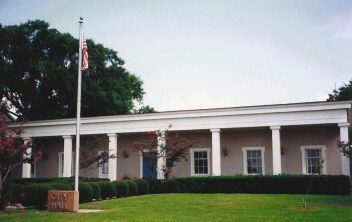 The new City Hall was to replace the former Hall which was condemned due to heavy damages sustained by Hurricane Camille. The Facility would provide 4000 square foot of space with a Mayor's Office, separate quarters for Clerk and Tax Collector and the Utility Department as well as a Board Room Auditorium to seat approximately 90 people. The site was determined to replace the "old Pass School" [which was closed in 1937] at Hiern Avenue and Scenic Drive at its present location. The Ground Breaking ceremonies were performed in August of 1970 with the acceptance of a Building Fund projected at $128,000.00. The Corner Stone from the Old City Hall which indicated its construction in 1926 was placed at the site of the New City Hall flag poll. By February of 1971 the new building was completed and the offices were occupied by the City Departments and the Mayor. However, the building was not accepted as finished, as duly noted by Alderman Arthur Hyatt, "The roof leaks!" Alderman Clay Rick remarked that the Plaque spelling was incorrect. And Alderman Jim Cerra complained that he wouldn't vote on any matter until the lights were corrected. The old two-story City Hall, located at the foot of Market and Scenic Drive, was actually centered on Market Avenue and blocked the view to the Gulf. The U.S. Army Corps of Engineers was called in to demolish it in October of 1970 due to severe damages incurred by Camille in '69. Pass Christian, Mississippi --- July 4, 1976"
Pass Christian is located in Harrison County, Mississippi. As of the 2000 census, the city had a total population of 6,579. 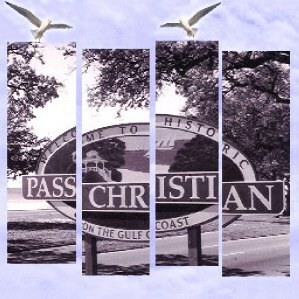 Pass Christian was the hardest hit city during Hurricane Camille in 1969, resulting in diminishing its population and its growth for several decades. This occurrence took place again in 2005 with the arrival of Hurricane Katrina. Pass Christian is located at 30°19'28" North, 89°14'50" West. According to the United States Census Bureau, the city has a total area of 15.3 square miles. Of which, 8.4 sq. miles is land and 6.9 sq. miles of it is water — resulting in 44.97% of the total area being covered water. As of the Census of 2012, there were 4,966 citizens. consisting of 2200 acres, containing 109 buildings.